Automated high-throughput Scanalyzers combine rapid automated data recording with advanced analytical software and machine learning. LemnaTec is the global specialist for automated Scanalyzer Solutions that not only save time and labour, but also provide a much broader base of information compared to visual scoring. We deliver advanced automated measuring systems for high-throughput recording of multi-dimensional phenotypic data. 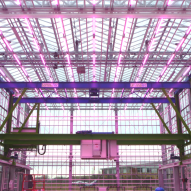 Imaging and sensing units combined with mechanical automation can be mounted into indoor growth spaces such as glasshouses, growthrooms, climate chambers, or indoor farms. 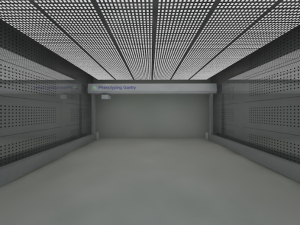 LemnaTec offers the Scanalyzers in a Plant-to-Sensor configuration, using conveyers that transport the plants to imaging cabinets, or in a Sensor-to-Plant configuration, where a gantry moves the sensors across the plant area. In the third configuration, we address roots and shoots simultaneously. 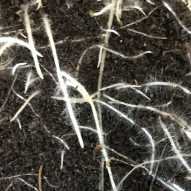 Licensing the Growscreen Rhizo from Forschungszentrum Jülich GmbH, Germany, we offer an automated root and shoot phenotyping system for soil-based systems. Thus, our system is superior to other methods that use artificial media for plant growth. We recommend to record environmental data in the plant growth area, such as temperature, light, or air humidity. We offer recording systems that store the environmental data together with the phenotypic data of the corresponding plants. The LemnaTec Greenhouse Scanalyzer Plant-to-Sensor system enables quantitative, non-destructive analysis of phenotypic traits of different plant species, comprising the major crops and model plants, in an automated high-throughput operation. 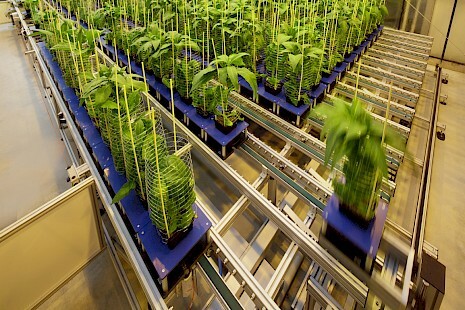 Plants are systematically transported by conveyors to a series of imaging cabinets, where specialized cameras acquire high resolution images. Together with plant weighing and watering modules the LemnaTec Greenhouse Scanalyzer provides a fully automated solution for high throughput plant phenotyping. In the Greenhouse Scanalyzer, each plant is imaged sequentially with multiple camera units, employing different wavelengths in the visible and non-visible spectrum. Besides visible light imaging, LemnaTec offers imaging options in the near-infrared spectrum, hyperspectral, fluorescence, and chlorophyll fluorescence imaging. 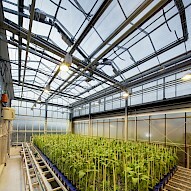 The result is an unprecedented number of reproducible data points on many aspects of plant health and development. 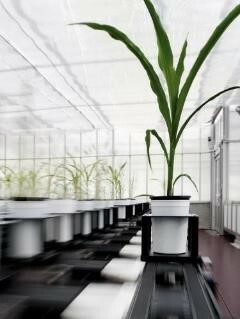 Imaging cabinets are available for different plant sizes Standard size harbours plants up to 2 m height. Special solutions are possible upon request. Conveyers are available for different sample sizes and weights Standard conveyers carry samples up to 8 kg payload. Higher payload is possible upon request. Example: 1.8 m tall plant in 20 cm (height/diameter) pot (= 2 m overall height); total weight with wet peat soil 6 kg. by avoiding the need for a single box containing all sensors at once. 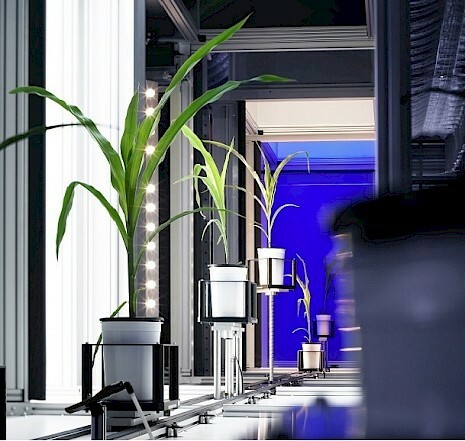 Moving the sensors across the area inside the room, the system operates in sensor-to-plant mode and thereby records data of single standing plants, or of canopies, depending on the experimental configuration in the room. Time scheduling for repeated time course measurements with all sensors is available, so that continuous monitoring of the samples with all sensing equipment is achieved. While most phenotyping solutions focus on above-ground traits of the plants, roots are usually hidden in soil and thus not accessible to measurements. To make them visible, specific cultivation measures are available. The Growscreen Rhizo uses soil-filled rhizoboxes placed at 45° angle that have a transparent plate where roots are visible for image recording. In collaboration with and under licence of the Forschungszentrum Jülich, LemnaTec offers the Growscreen Rhizo as combined root-and shoot- phenotyping system. Core component is an image acquisition cabinet with high-resolution cameras focused on the roots and the shoots of the plants. Thereby, classical shoot imaging is done simultaneously with precision root imaging. 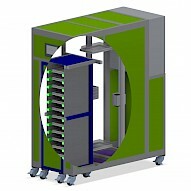 The cabinet is also equipped with dedicated illumination to enable optimal image recording. A balance and water supply system can be mounted for precise control of soil water content, enabling growth scenarios with different water availability. 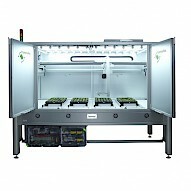 Automation technology is available to move in and out the rhizoboxes so that experiments with repeated time-course measurements can be planned. Automation can be done with conveyer-based systems or with magazine automation technology, depending on the local requirements. 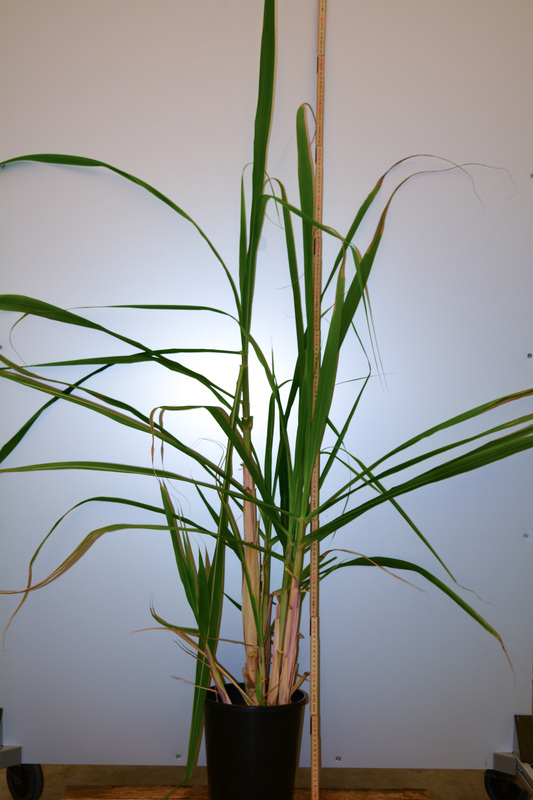 Software tools give access to shoot- and root- phenotypic traits such as growth and morphology. Root systems are characterised for root system depth and width and for spatial root distribution, together with root length and width data, rooting angles or total root area. Shoot systems are analysed for height, width, area, and morphological factors, together with colour data. Nagel KA, Putz A, Gilmer F, Heinz K, Fischbach A, Pfeifer J, Faget M, Blossfeld S, Ernst M, Dimaki C, Kastenholz B, Kleinert A-K, Galinski A, Scharr H, Fiorani F, Schurr U (2012) GROWSCREEN-Rhizo is a novel phenotyping robot enabling simultaneous measurements of root and shoot growth for plants grown in soil-filled rhizotrons. Functional Plant Biology 39:891. While most phenotyping solutions focus on above-ground traits of the plants, roots are usually hidden in soil and thus not accessible to measurements. To make them visible, specific cultivation measures are available. The Growscreen Rhizo uses soil-filled rhizoboxes placed at 45° angle that have a transparent plate where roots are visible for image recording. In collaboration with and under licence of the Forschungszentrum Jülich, LemnaTec offers the Growscreen Rhizo as combined root-and shoot- phenotyping system. Core component is an image acquisition cabinet with cameras focused on the roots and the shoots of the plants. 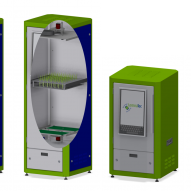 Automation technology is available to move in and out the rhizoboxes so that experiments with repeated time-course measurements can be planned. Software tools give access to shoot- and root- phenotypic traits such as growth and morphology. Root systems are characterised for rooting depth and width and for spatial root distribution. To ensure a high degree of homogeneity within treatment groups, LemnaTec’s MOVING FIELD uses conveyers to constantly move plants around in a predefined sequence. This also enables users to optimize plant density and simulate more realistic agricultural growing conditions resulting in more relevant research data. 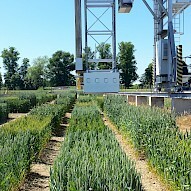 In phenotypic studies there is an increasing demand for sensor-to-plant platforms, as it is preferable not to move the plants to avoid mechanical stress. 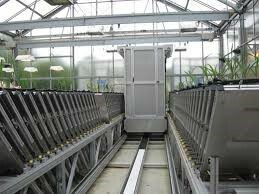 For such applications, a motorized gantry can be fitted inside the greenhouse to transport sensors above the plants. The Greenhouse Scanalyzer Sensor-to-Plant can carry a variety of sensors that capture phenotypic properties and sensors for environmental factors.